—President Woodrow Wilson (1856–1924), from his address to a joint session of Congress, April 2, 1917. 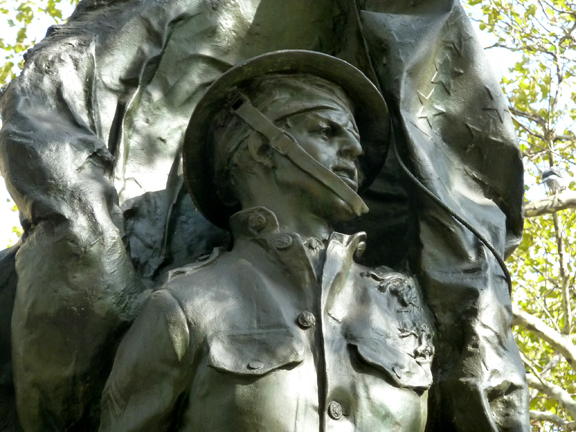 The Doughboy Memorial stands in Abingdon Square Park. This is the third posting made to commemorate the 100th anniversary of the First World War. A June 28th post was made that marked what set off the Great War, the assassination of Austria’s Archduke Franz-Ferdinand. An August 4th post marked the declaration of war and the commencement of hostilities between Great Britain and German. The figure appears to be charging through the Forest of Argonne. This World War I-related post recognizes the end of the Great War. Today, November 11th is known as Armistice Day in England and elsewhere; it marks the accord that brought an end to the fighting in First World War, at the 11th hour of the 11th day in the 11th month. In the United States November 11th is called Veterans Day. Notice the flag’s stars and its fringe on the figure’s shoulder. However true Mr. Churchill’s statistic may be, of the remaining 20 per cent of the World War I casualties, some were Americans. And of those American casualties, some came from Greenwich Village. In towns and cities across the United States following the war’s end, memorials to those dead young men were commissioned, erected and dedicated. This is the memorial honoring those who fought and died in the Great War, the war to end all war, from New York City’s most-storied neighborhood, The Village. The soldier’s grip on the flag staff is solid. Standing on a gray Maine granite pedestal, this dramatic bronze shows a foot soldier—called a doughboy—holding an American flag that engulfs him. This is my second-favorite work of art in a city park. It is wonderfully alive! The soldier has his pistol drawn in his right hand and the weight of his body is shifted to the right left. His mouth is open, yelling. The doughboy’s movement can be felt and his cry can be heard. The grip of his left hand on the flag’s staff is tight. From the stars of the flag and its fringe on the man’s shoulder to the ‘U.S.’ embossed on the flap of the holster and the cord that ties it to the soldier’s leg, the detailing is astonishing! At the same time there is something raw about the figure. I find it thrilling! He is enveloped in the flag. This dynamic sculpture is the work of Philip Martiny (1858–1927). A native of Alsace, France, the sculptor, active in the late-19th and early-20th centuries, was granted many public commissions. 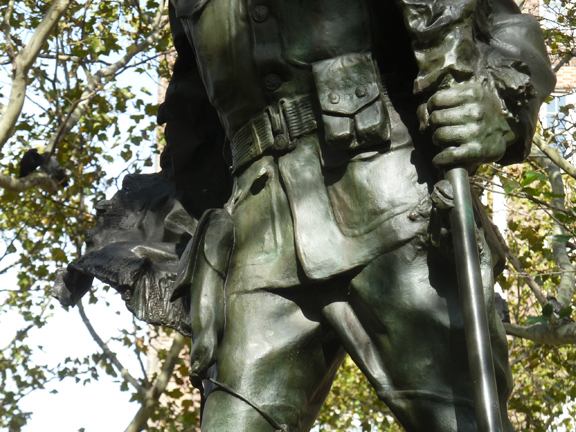 Among them were the Chelsea Doughboy in Chelsea Park, at West 28th Street and 9th Avenue, and this one. The same model posed for both. The unveiling of the Greenwich Village Doughboy was attended by 10,000 on-lookers, including 200 Gold Star Moms, who had lost their sons in battle, and New York Governor Alfred E. Smith. The young man’s pistol is drawn. Martiny’s doughboy stands in its original location, Abingdon Square Park, a trapezoidal-shaped plot of land. It is bound by Eight Avenue, Hudson Street, and West 12th Street (once called Troy Street). It has been a public park since 1836. The monument was conserved in 1993. The park was beautifully and invitingly redesigned in 2004. Flower beds, park benches, drinking fountains and a small rolling lawn replaced a buckled asphalt pavement and broken swing sets. The Jefferson Democratic Club commissioned the bronze, and made a gift of the monument to New York City. The organization’s headquarters once stood across from Abingdon Square Park on the present site of the 1931, Emory Roth-designed condominium apartment house at 299 West 12th Street. The Abingdon Square Doughboy seen from the rear. The origin of the word doughboy describing an American soldier remains in doubt. It was first used by the British in the late-18th and early-19th centuries to describe soldiers and sailors who would have been familiar with the fried dough dumplings called doughboys. Looking up at the bronze is dramatic. In the United States, the nickname came into common usage during the Mexican-American War (1846–1848). When American soldiers marched through the dry territory of northern Mexico, the clung to their uniforms giving the appearance of dough. The term was widely popularized during World War I (1914–1918), referring to infantrymen. Because the soldiers’ uniforms had large globular brass buttons, shaped like doughboy pastries, the connection was made between the dumplings and the soldiers. The name sculptor, Philip Martiny, appears on the bronze’s base. Philip Martiny’s bronze Abington Square Doughboy can be seen on Walk About New York’s Greenwich Village Walking Tour. The marble eagle he contributed to the Washington Arch can been seen at the start of the tour. Verticality: the tree, the Doughboy, the figure in the distance. “God would never be cruel enough to create a cyclone as terrible as that Argonne battle. Only man would ever think of doing an awful thing like that. It looked like “the abomination of desolation” must look like. And all through the long night those big guns flashed and growled just like the lightning and the thunder when it storms in the mountains at home. Thank you; this is interesting and moving. You sure have a lot of information about this.